Yes, there was a mis-communication, and I have designed the last block. Hope you don't mind too awfully much! The small triangles are 2 1/2" squares. 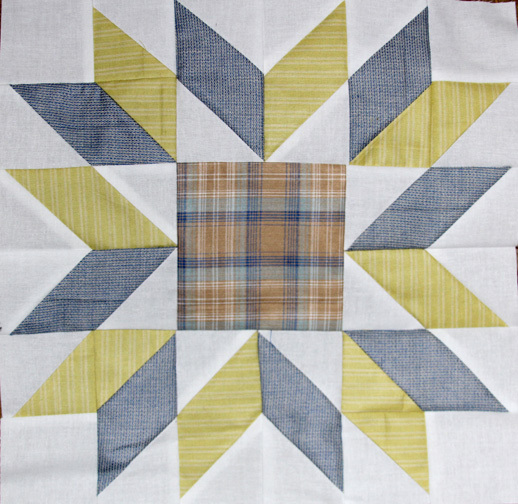 I have used three light green fabrics for the green triangles. The instructions call for all of these to be the same. 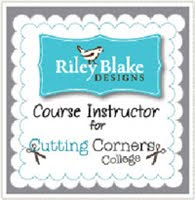 This may be a place where you use different scraps that you have left instead of cutting new squares. The drawing will be from the flickr group. The drawing tonight (first thing in the morning really) is for any blocks posted since my last block was posted. The drawing is technically for block 11, but any blocks posted will be in the drawing. There will be some of you who are quick and will get your blocks posted. 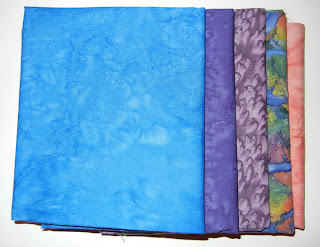 We will have three winners -- fabric, patterns, and a pattern book. 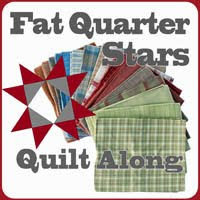 Stay tuned tomorrow for winners and a schedule for the rest of the quilt! Disclaimer: None of these ideas are actually recommended, but they have been shown to work on at least one occasion which may or may not have been yesterday. Make a baby quilt instead -- Then you'd be done already, and there would be no point to this post. 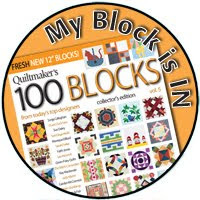 Make 16 blocks instead of 36 blocks and double the size of the border which makes the quilt 80" square instead of 93" square. 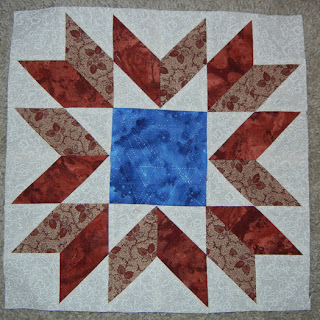 Even though the pieces of all 36 blocks are cut and half sewn. Yes, it's smaller, but still technically a queen. Besides being smaller, 80" is important because that is the largest to go before needing to add an extra piece to the backing. Have peanut M&Ms for supper. The nuts make them healthy - maybe. Have one of the children practice the art of cooking - for the other children. Do allow the children eat all the yogurt, bananas, and other snacks just purchased that should have lasted several days. They were mostly healthy, and it allowed you to stay in the basement sewing. Don't go to bed before midnight. If you get to bed before midnight, then you shouldn't have been stressed in the first place. Do press. It's a necessary evil. Just because you need to make it quickly doesn't mean it should look like it was made with haste. Maybe press a little faster than usual. Don't use the seam ripper unless it's a small piece. Instead set the mistake aside and make a new piece. After all, there are extra pieces for 20 extra blocks. Lengthen seam allowance two clicks. Not enough to notice, but maybe enough to make a difference. If the thread breaks once, rethread the needle. If the thread breaks twice, rethread the machine. If the thread breaks three times, change the needle. You probably needed a new one any way. Don't find a back that is "perfect." 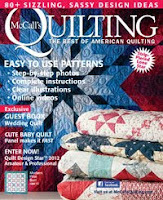 Yes, the quilt shops are open online, but they won't get the fabric to you in time. Instead, find a back that "might work" in the fabric you bought on clearance just for this occasion. "Might work" really "does work" in times like these. Do take a quick break to run kids to their activities. The time saved not taking them isn't worth the trade off of whining and/or arguing that is practically guaranteed to last longer than the car trip. Don't listen to your achy back, tired eyes, and cramping foot. Do listen to funny noises from the sewing machine. It usually means an empty bobbin, but it could mean something else is wrong. Either way, it's generally something that is better if caught early. Don't promise the kids you will do something fun the next day unless you are going to follow through. Do let the little one help hand you pieces before shuffling him/her upstairs. Again -- whining factor coming into play. Don't forget to take pictures. 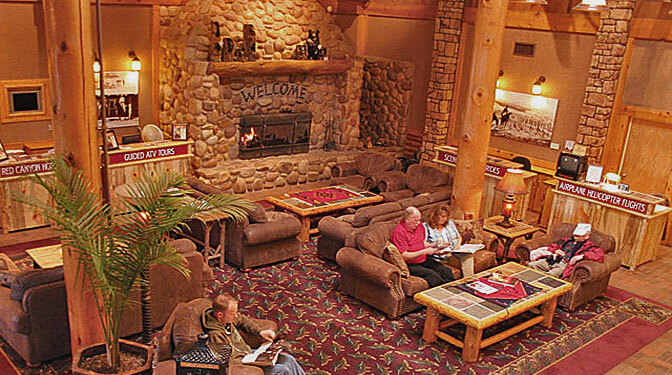 People who read your blog will want to see pictures even if you can't show them now. Do brush your teeth even though you are so tired you want to collapse from exhaustion. Remember what you had for supper. Don't plan on shipping it overnight. You could buy LOTS of fabric for the extra cost. Two-day, on the other hand, is sometimes worth it. 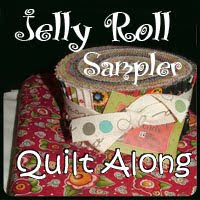 Do tell your friends you are sorry that you didn't get to show them the quilt before it got shipped off. I'm sorry. Looks like a lot of you are as busy as I am! It was a smaller group of beautiful stars this time. Among that group, we have two winners! Congratulations! 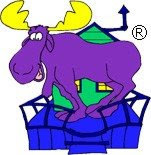 Email me at kluckau@moosequilts.com and Nancy and I will get those out to you! Block Eleven! How did that happen??? 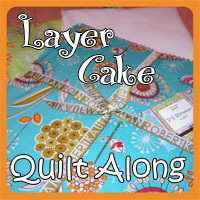 That is the fun thing about quilt alongs -- you just sew along and all of a sudden you have enough blocks for a quilt! 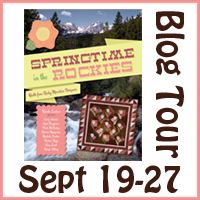 My name is Nancy Miller and I am originally from central Indiana. I have lived in Indiana, Wisconsin, South Carolina, and currently North Carolina. 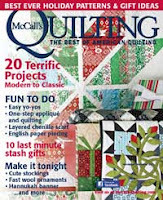 My mother and grandmother taught me to sew very young to help with the mending, but it wasn't until, in my 30s, a friend introduced me to quilting, where I have won many awards and have shown quilts nationally. I love experimenting with designs. I draw my patterns by hand and in EQ6. 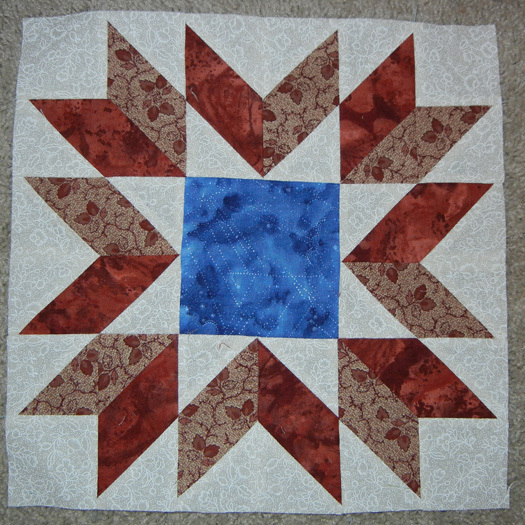 I sometimes start with an existing block (like Ohio Star), make some changes, and see what it looks like. 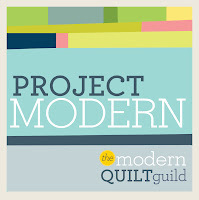 I have run a mystery quilt group (MysteryQuilts4Military) online since 2005, to make quilts for soldiers wounded in Afghanistan and Iraq. I have been blessed to meet some of those soldiers and receive their thanks personally. When we moved to North Carolina, we simultaneously became empty nesters, so with no friends and no family, I started up a blog to have someone to talk to. You can find me at http://lifetakesaturn.wordpress.com . 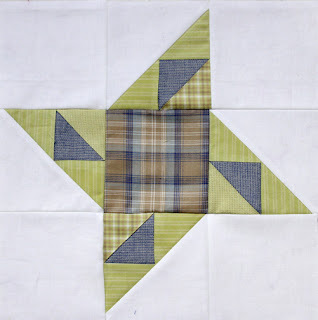 Here's Nancy's block called Fractured Star. Here's my version of Nancy's block. It isn't as hard as it looks! The drawing will be from the flickr group. 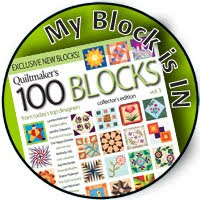 The drawing tonight (first thing in the morning really) is for any blocks posted since my last block was posted. The drawing is technically for block 10, but any blocks posted will be in the drawing. 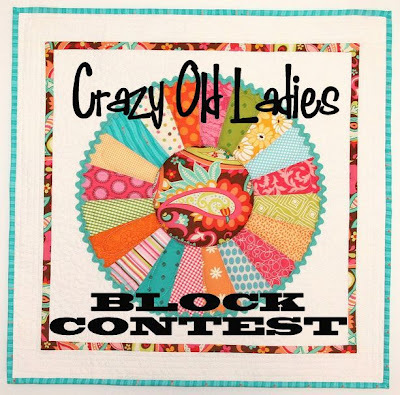 There will be some of you who are quick and will get your blocks posted. 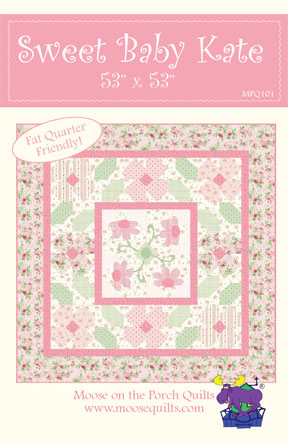 Nancy has these fat quarters! And I have another pattern book! My friend, Emily Herrick, of Crazy Old Ladies got a crazy fabric giveaway hair. She is giving away 1 yard of each of her new Hall of Fame fabric line plus other stuff! Crazy!!! Quilt retreats are something I don't really get to do yet, six little kids and all. But today I am headed down to Bryce Canyon for a quilt retreat! Although I don't think I will actually leave the hotel! 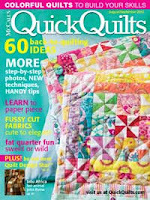 Building Blocks from my Simply Charming Kids book which combines fat quarters with charm squares for a quilt that is really easy and fun to make. and Sweet Baby Kate, named after one of my babies who isn't a baby anymore, which is my first single pattern with Northcott. In the pattern her it is shown in sweet, girly pastels. I have also made it in bright Amy Butler prints. So fun! 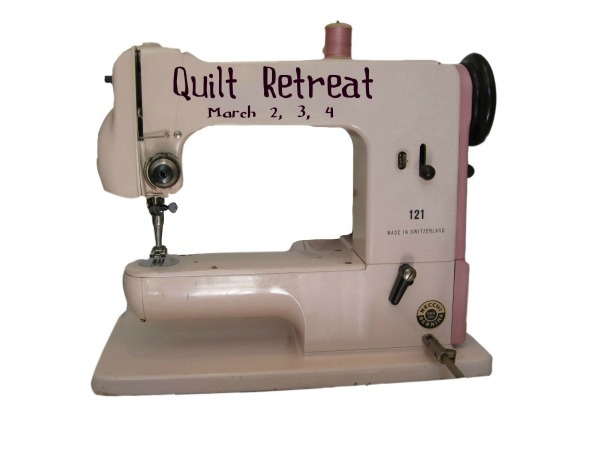 I will be giving a trunk show on March 2nd at another retreat! 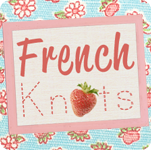 This retreat is hosted by French Knots! 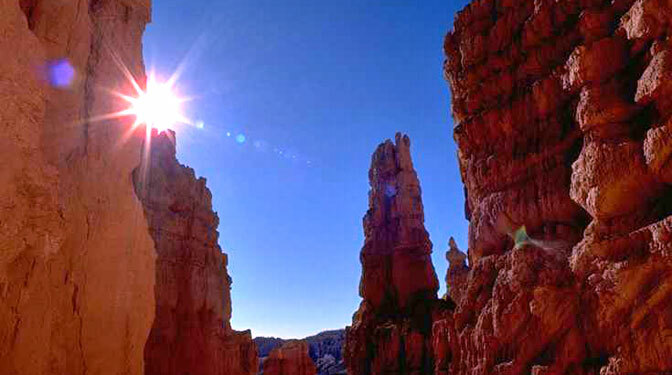 By then, I will have all these projects from the Bryce Canyon retreat to show off! You laugh, but I hope to pull it off, well, half of it anyway! 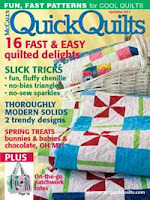 I am in the middle of getting a new book ready for Market, so I will have many new quilts to show. 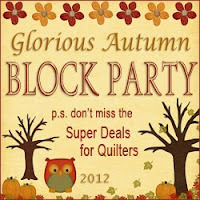 Kati from the blue chair, or more accurately, Kati from "from the blue chair," will also be giving a trunk show there. I am looking forward to seeing that. She does excellent work! Now off to throw something into a suitcase and hope I don't forget something important! Despite my not posting them yesterday, we do have winners! Let's see who they are! 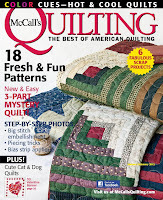 and the winner of one of my quilt books is Judy 1522! Congratulations! The first winners just need to send me their email address, but Judy1522 needs to send me (kluckau@moosequilts.com) her mailing address!